Growing up watching the Tour de France I learnt from an early age that farmers, well French farmers, are good campaigners. Your average Tour in the 1990s wasn’t compete with farmers and tractors delaying a stage. There British brethren haven’t been as visible, but over the last few weeks the success of dairy farmers in getting supermarkets to increase the price the pay for milk has been a summer campaign success, and from what I can tell all without the need for an email petition. It’s been an interesting campaign to follow and I’ve been struck by a few lessons for all campaigners from it. 1 – Pick the right target – the farmers haven’t focused on all supermarkets but a handful (Morrissons and Asda) that aren’t paying a fair price. It’s a smart approach focusing on brands that are in a very competitive market and don’t want to be seen to lose the favour of customers. By playing the supermarkets off against each other they’ve created a virtuous cycle where no retailer wants to be caught out. Interesting now they’ve won the first round, all the supermarkets have agreed to pay more, the asks and target of the campaign aren’t nearly as clear but they’ve got the momentum of a quick win. 2. Think about the values behind your messages – listen to any of the protesting farmer and, yes there are messages about the importance of preserving our rural way of life and protecting our national food security, but it’s also about fairness and hard working farmers being bullied by the profit driven supermarkets. They’re powerful messages that will resonate with many whatever their political persuasion. It’s a smart communications strategy. 3. 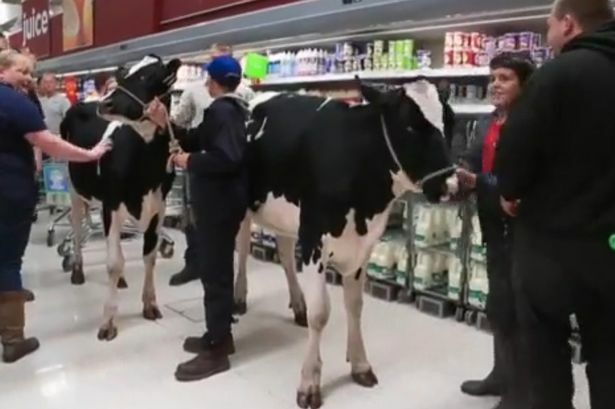 Produce a great image – Who can’t fail to find both the images of farmers buying up all the milk in a store with the #milktrolleychallenge or even better taking a cow into a supermarket an intriguing and powerful image. Firstly through social media and then through broadcast media it’s a great image to fill the media in the traditionally quiet ‘silly season’. 4. Find authentic spokespeople – I’ve actually no idea if any specific organisation is behind the campaign (I’m assuming it’s the NFU or similar) but that’s in part because everyone I’ve heard interviewed for the campaign is a farmer, so the message is direct from the (ahem) horses mouth. What the campaign has lost in professional polish it’s gained from an authentic and directly affected voice.